Helene Noisette’s father believes war is imminent. Convinced that Germany will head straight for Paris, he sends his family to Beaufort, a small village in northern France. But when war erupts a few months later, the German army invades neutral Belgium, sweeping south towards Paris. And by the end of September, Beaufort is less than twenty miles from the front. During the years that follow, three generations of women come together to cope with deprivation, fear and the dreadful impacts of war. In 1917, Helene falls in love with a young Canadian soldier wounded at the battle of Vimy Ridge. But war has a way of separating lovers and families, of twisting promises and dashing hopes, and of turning the naive and innocent into the jaded and war-weary. As the months pass, Helene is forced to reconcile dreams for the future with harsh reality. Lies Told In Silence is available from Amazon, Nook, Kobo, Google Play and iTunes. “M.K. 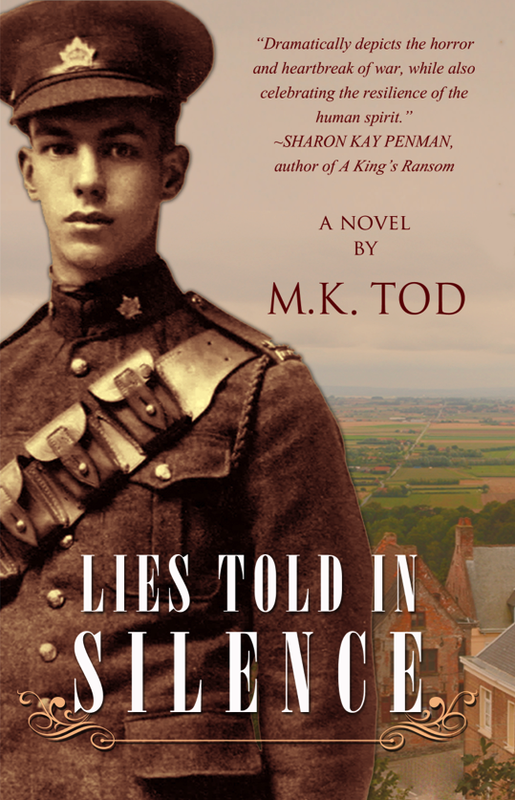 Tod brings WWI France to vivid life in LIES TOLD IN SILENCE. We come to care about her characters, whose secure, sheltered lives will never be the same. This is a novel that dramatically depicts the horror and heartbreak of war, while also celebrating the resilience of the human spirit.” – SHARON KAY PENMAN author of A King’s Ransom. “Rich with distinctive details, LIES TOLD IN SILENCE, is a fully dimensional tale, a crisp rendering of war on all fronts. An intricate, well-researched study of life forever changed by WWI yet still sweet with the tender innocence of the age. With sterling prose, Tod captures the period and the nuanced tension of her story perfectly.” – DONNA RUSSO MORIN author of The King’s Agent. “An exquisite tale of true love and living with the choices we make set amidst the tumultuousness of World War I. Compelling and poignant, I was deeply engrossed from the first page to the last, unable to pull myself away from Helene’s story. M.K. Tod is a powerful new voice in the historical fiction genre and I eagerly await her next release.” – AMY BRUNO Historical fiction blogger at Passages to the Past. “In her accomplished second novel, M.K. Tod depicts the ruinous impact of war on human lives across the generations—young people, their parents, women, and soldiers. A multi-layered depiction of a French family adversely affected by World War I … an absorbing and rewarding historical read, well-timed for the centenary.” – MARGARET EVANS PORTER Author of The Proposal. “Readers of M.K. Tod’s multi-generational WWI story will particularly enjoy seeing the war through the eyes of both men and women, and from the corridors of power to the front lines and small villages of northern France. LIES TOLD IN SILENCE is a compelling read right up to its taut page-turning ending.” – RICHARD LEE Founder of the Historical Novel Society. do you know who owns the copyright of this poster? I do not, Nina. I did list the source (M.E. Clark) but I can no longer recall where exactly I found it. Are you interested in WWI?